Sun Set Taverna is one not to be missed! Food is all homemade – some are their own original recipes – and all are beautifully presented. There are plenty of vegetable dishes – the courgette balls and artichoke pie are the BEST! The meat has a flavour all of it’s own – a feast for the tastebuds! 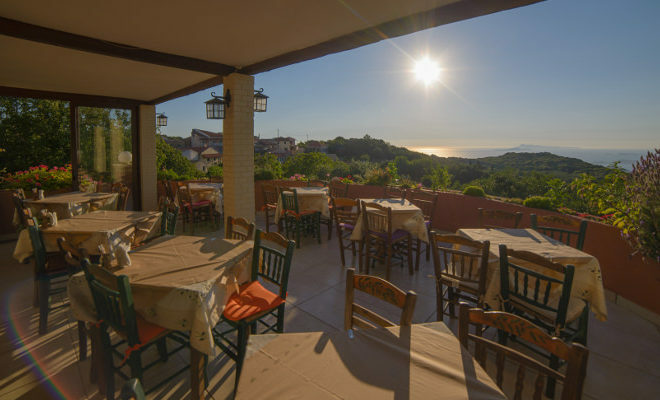 Beautiful views to soak up, the nearby village of Macrades,sea in the distance with outcrops of islands; you are surrounded by trees and flowering plants…it’s all so peaceful! A beautiful experience! "Great view with a nice meal"
We came for the sunset view stayed for the dinner. The food was good at the right price. The staff was friendly and efficient. "Very nice food, lovely terrace with a magnificent view"
The service was very friendly. Although it looks a bit touristy from the outside, actually inside the terrace is very tasteful, and it has a fantastic view of the coast. The food was delicious at a reasonable price. We had tzatziki, moussaka and cheese saganaki. "Certainly does what is says on the tin"
Return visit here but first review.Amazing sunset views of the terrace,delicious home produced and cooked food,I had days special lamb in oven,wife had plate FULL of delicious lamb chops.Delicious local yogurt,honey,walnut was complimentary and perfect end to meal. Great value and friendly owners. We will always drive up from Paleo when we visit again you should too,it’s worth it ! !